Why do XUK campers become leaders? "The action of leading a group of people or an organization, or the ability to do this." We are fortunate that some of our campers apply to work at our residential and day campers once they turn eighteen to become part of our staff team. We believe, that even if they do not end up working as part of our team, all XUK campers become leaders. Studies show that teenagers and young adults have a tendency to take on leadership roles at school or in the workplace, if they attended a summer camp as a child or teenager. Never underestimate the power of summer camp. Sadly, it can be skipped over at a university or job interview. Employers are often just interested in your relevant experience. However, what our campers learn at our camps is so valuable – leadership skills. Being away from home at a residential camp requires the ability to make independent choices and the need to take control of your own situation, belongings and experience. Campers will quickly see how they become more self-reliant and develop into independent beings. Throughout each day, our campers will come across lots of decisions to make. From what to wear each day, to what to have for breakfast to how much money to take out of the camp bank for a trip. We believe that it teaches our campers to make their own independent choices and are leading the way to their own happiness. Throughout their stay with us, campers, as any good leader does, will need to think quickly and creatively. This could be in an Evening Activity. As a team, they might have just half an hour to design and a costume to meet certain specifications or come up with a brilliant hiding place in a wide game, away from the other teams. We all have our own strengths and weaknesses. Teams are a fantastic way to work together and play to one another’s strengths. Our young leaders will need to decide who has the best personality for different roles in activities. Our camps are structured in a way that ensures there is constant teamwork throughout the day. Whether that is helping our staff team to clear equipment away after an activity or ensuring your whole team makes it through the spiders web in problem solving, our campers feel very much part of the community, the XUK family. When you are living with others who might be from a completely different walk of life to you, it is important to be flexible and have an ability to compromise, a trait of a good leader. You might not always get your first choice of activity or have to turn your bedroom light off a little earlier than you have hoped, but this flexibility ensures that everybody can get along! We are incredibly proud of our staff team and our return rate. These are the people who our campers look up to and aspire to be like one day. Our team models what true leaders look like in through the way they interact and communicate with both our campers and their fellow team members. We like to add challenge to lots of our activities. Campers will learn from listening to each other, sharing ideas and supporting others. From working together to suss out which is the best route to take on a Treasure Hunt to playing to everybodies creative strengths to win Scrapheap Challenge, they will work together in activities to accomplish a task. They will learn from each others initiative and how to effectively communicate, whilst having tonnes of fun! Finally, our campers inspire others. 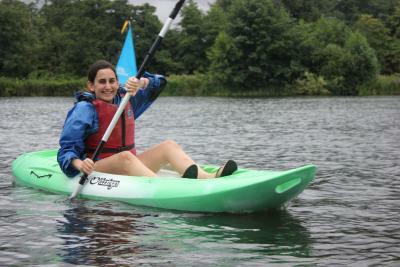 They promote our camp culture and contribute significantly to our safe, friendly and cosy atmosphere. 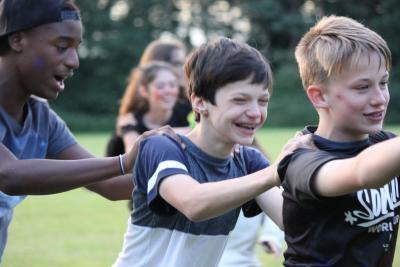 XUK campers will always be there for one another, cheering each other on and encouraging their peers to try something new, helping them to grow in confidence.